Residency is largely a paid apprenticeship. The new MD works under the direction of licensed physicians termed “attendings,” whose job it is to supervise, teach, and evaluate the residents, while also ensuring the safety of the patient. Residents rotate through various areas of their chosen specialty in a relatively strict curriculum set out by the Accreditation Council for Graduate Medical Education (ACGME). As they progress through training they earn more autonomy and responsibility, but are always under the direction of an attending who is ultimately responsible for the patient. A physician can obtain a medical license after completing an internship and passing USMLE Step 3. Residency, so called because in the old days one actually lived in the hospital to be amply available, has continually decreased in required hours. When I was a resident (residents love it when you start a conversation like that), there were no hours’ limits (and the hospital was uphill in the snow). A pediatric surgery colleague was on call for 14 days straight (never left the hospital), though that was certainly the extreme. In our Critical Care rotations we took in-house call at least every 3rd night, and occasionally every other if someone went on vacation or fell ill (can’t imagine why that would happen). That means we worked 36 hours, went home for maybe 12, and returned to do it again, including weekends. Calling in sick is frowned upon for obvious (if illogical) reasons. So, if in your story you want the resident to work ungodly hours, it would be more appropriate to put them in residency pre-2003. That said, violations continue to occur and some specialties pay lip-service to work rules, with residents still working 100+ hours per week. After residency, many graduates choose to pursue sub-specialty training, termed fellowship. Some of these are regulated by the ACGME, but many others are not, and have more flexibility in their design and accreditation (and salary). After Internal Medicine residency, one might spend another 3 years to become a Cardiologist; after 5 years of General Surgery, one might spend 2 more years in Pediatric Surgery; after my own 4 years of Anesthesiology, I did a 1-year Obstetric Anesthesia fellowship. These can be stacked…after becoming a cardiologist, one might complete another 1-2 years to become an Interventional Cardiologist (putting in coronary artery stents, etc). One could become a career trainee if one were so inclined (and crazy). 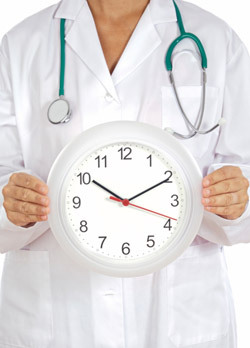 Then, on June 30, residents and fellows around the country graduate and start a new job, probably in private practice, and 24-hours later they have no supervision, no duty hours, no back-up. Hmmmm, what could possibly go wrong? Graduates must complete a national specialty-specific exam, written +/- oral to become Board-certified. Board-eligible means they are eligible for board certification (d’uh) …which might mean they have not yet been out long to enough to complete the examinations (it takes at least a year in some specialties), or they chose not to take them (suspicious), or they already failed once or twice but not the fatal third time that would require additional training. This entry was posted in Uncategorized on September 30, 2016 by teuliano.